A microprocessor generally does not have RAM, ROM and IO pins. It usually uses its pins as a bus to interface to peripherals such as RAM, ROM, Serial ports, Digital and Analog IO. It is expandable at the board level due to this. A microcontroller is 'all in one', the processor, ram, IO all on the one chip, as such you cannot (say) increase the amount of RAM available or the number of IO ports. The controlling bus is internal and not available to the board designer. This means that a microprocessor is generally capable of being built into bigger general purpose applications than a microcontroller. The microcontroller is usually used for more dedicated applications. All of these are very general statements. There are chips available that blur the boundaries. As was mentioned microcontrollers are essentially systems on a chip. Except for some specialized peripherals everything is in one package. Interface to external peripherals is almost always done using serial connections. This keeps the package sizes small (less pins) and the PCB size small (less pins to connect between packages). need special hardware to interface with sensors, motors, LEDs, etc. I find it interesting that the LEGO Mindstorms NXT set has a microprocessor [32-bit AT91SAM7S256 (ARM7TDMI) main microprocessor @ 48 MHz (256 KB flash memory, 64 KB RAM)] for doing the thinking, and a microcontroller [8-bit ATmega48 microcontroller @ 4 MHz (4 KB flash memory, 512 Bytes RAM)] for interfacing with the sensors and motors. See technical specifications on Wikipedia. This distinction is one that is much harder to make these days, since a whole spectrum of devices has arisen between the extremes, but if there's one identifier that seems to work, it's to look at the pin-out, and look at what the designers did with the pins. Are they mostly individual I/O? Or do buses dominate? In my view, a microcontroller has traditionally been something that works as a 1-chip solution; put one on a PCB with a few unavoidable discretes, and some connectors, write a small amount of software, and you have a system. The microcontroller contains all the memory, volatile and not, that the system needs, the price paid for this convenience being that there wouldn't be very much of either at hand. Most of the pins are dedicated to I/O functions. Whereas, at the other extreme, the microprocessor is the sort of beast to offload as much as possible to support chips, in order to dedicate silicon to maximizing the throughput of the CPU core. Most of the pins on this kind of device are address and data lines, necessary in order to connect to the memory and I/O devices that the core lacks. It's still possible to call some things microprocessors, and other things microcontrollers, when the designers clearly adhered to one philosophy or the other. An Intel Core i7 is clearly a processor, PICs and AVRs are clearly controllers. At this point in time, however, with the amount of logic that can be put in a single chip, you can easily embed an entire 1990 microprocessor system into a single chip. What do you call a 400MHz PPC604 with an interrupt controller, an SDRAM controller, ethernet support, and a slew of other peripherals, all on one chip? There's some other weird terms; Analog Devices has (or had) something they called "microconverters" which were like ADC/DACs with a microprocessor built in. TI is now calling some of their DSPs (the C2000 series) Digital Signal Controllers. I would suggest that a microcontroller is a device that contains enough internal memory and circuitry that, at least in some variants, it could perform some useful function without external memory. By such a definition, the 8051 would have enough circuitry to be useful by itself and the 8031 would not; the 8031, however, is simply an 8051 in which the contents of the internal ROM are unspecified (while it's entirely possible that some "ROMless" 8031 chips and variants leave the ROM space off the die, I would expect there are some others which, for consistency of die layout with versions which include ROM, include a useless blank ROM array). Just to add all above excellently written answers, Analogy : Microprocessor is a Brain. while Microcontroller is Entire Body. Brain is capable of Executing all the instructions but We need to attach Eyes,Hands (i.e. Peripherals) externally. microprocessors contain the processor core (fetch/decode unit, ALU, registers etc) and maybe a couple of more basic blocks, but usually not much more. microcontrollers add RAM (SRAM), usually some ROM (can be mask rom or Flash/EEPROM) for code storage (but can also be ROMless), and a set of basic peripherals (SPI/I2C, UART, GPIOs, maybe even USB or Ethernet and so on). Sometimes this gets called System-on-Chip (SoC), or sometimes SoC is something even more integrated. Some Japanese companies also love the term "microcomputer". However, as I mentioned, the line gets blurry. For example, recent Intel/AMD processors add a memory controller on the chip (previously it was in the chipset). BTW, I would actually call 8086 a microprocessor (Intel's microcontrollers include for example 8051 or 80186). In Microprocessor more op-codes, few bit handling instructions. But in Microcontroller: fewer op- codes, more bit handling Instructions. Microprocessor is a simple central processing unit (CPU) on a single chip (remember the word ‘Single Chip’). It includes Arithmetic logic unit (ALU), control unit (CU), registers, instruction decoders, bus control circuit etc. but everything should be on a single chip. Microcontroller: A microcoontroller is the association of microprocessor and the peripheral I/O devices, support circuitry and memory (both data and program). It is not necessary to be on a single chip (remember this point, not in a single chip). Microprocessor is one component of the microcomputer. Microcontroller is a complete computer similar to any other computer. MicroProcessor - Does the 'thinking', is basically a chip which handles math. Microcontroller - A system with a microprocessor included, readily capable of interfacing with electronic components for developing embedded systems. Not the answer you're looking for? Browse other questions tagged microcontroller microprocessor or ask your own question. What's the difference between a microprocessor and a CPU? 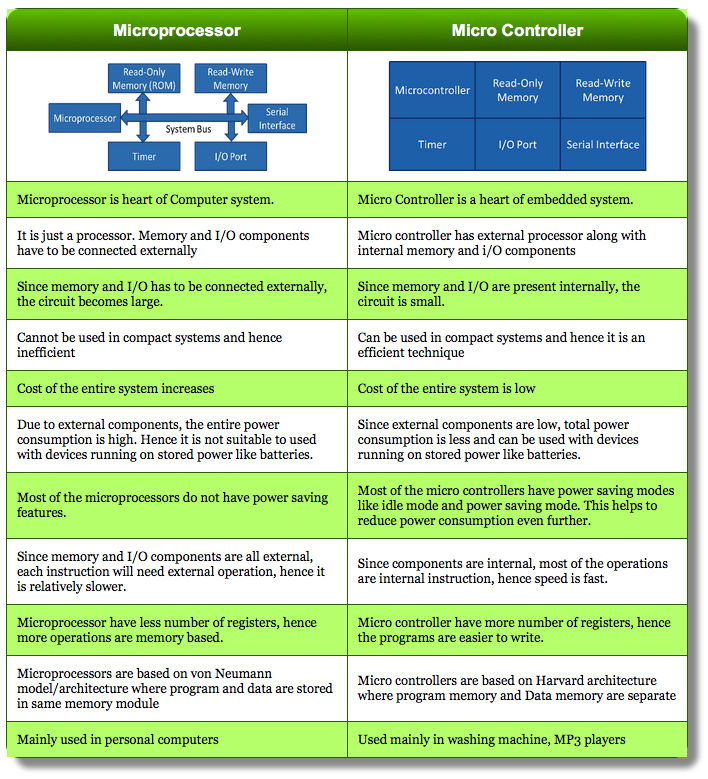 What is the difference between Micro-controller and Micro-Processor? Microcontroller and processor same thing or not? Is ARM a microprocessor or microcontroller? Programming Differences between a Microcontroller and a Microprocessor? Is the Raspberry Pi a microcontroller or a motherboard? Want to apply EE knowledge — which microprocessor would you recommend? Which is used in mobile phones? A microprocessor or a microcontroller? What's the difference between CPLD and an FPGA? Difference between Zilog Z80 and Z84? What's the difference between CC2564 and CC2564MODN bluetooth TI chips? What is the main difference between RST (0-7) and RST (5.5-7.5) in microprocessor 8085? Is MPC8260 microprocessor or microcontroller? Difference between “accelerator” and “microcontroller”? What is the significance of “microcontroller based on microprocessor”?